Comcast's touch control panel delivers alarm functions, home automation, and even weather updates. 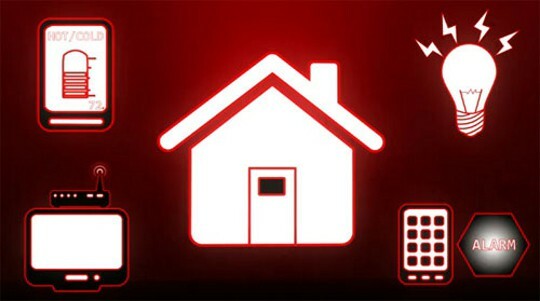 Verizon Communications, Bright House Networks, Comcast/Xfinity, and Time Warner Cable are all on the verge of making a major new push to get customers to consider signing up for home security through their respective bundled offerings. It’s just the latest new way telecommunications companies are responding to Wall Street’s insatiable quest for growth in the average revenue earned from each customer. But how good are these services, and how much are they going to cost? Time Warner Cable has offered security monitoring in a number of legacy markets inherited from their former owners. But now the company is beta testing an entirely new suite of home security applications in cities like Rochester, N.Y., with the hope of introducing the service later this year in additional markets. Time Warner Cable and Bright House seem to be jointly testing a similar system, designed to compete with 24/7 home alarm monitoring providers like ADT or GE Home Security. Although price points have not yet been announced, Stop the Cap! has learned the cable company intends to test a basic package of home monitoring including a limited number of monitored doors and windows for between $25-30 a month, not including upfront costs and installation. Like other alarm providers, additional services and protected points of entry will cost extra. The next generation of home security from Time Warner Cable will be controllable from apps for iPad and smartphones, in addition to a touchscreen control panel supplied with the system. By integrating the system with your home broadband connection, you can stream video from security webcams and configure alerts for any number of events. Bright House’s proposed system, for example, would let you set a text message alert when the kids got home from school. Want to know if someone sneaked out of the house in the middle of the night? The security system can alert you to that as well. Comcast/Xfinity has been rolling out a similar system in some of their markets. 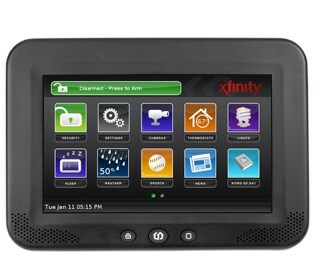 XFINITY® Home Security also delivers monitoring services, and provides remote access over the Internet. It will also let you remotely control home appliances, lighting, and any installed web cameras. Away from home and want to see if your spouse is up to no good? Now you can quietly spy on anyone in your home while you are away. Comcast’s basic monitoring package doesn’t include many of the coolest add-ons like video monitoring and access to a modern touch-based control panel that also serves up weather forecasts and even sports scores. Many customers end up with the “Preferred Package” because it delivers a much wider range of protective services. The service tested successfully in Houston and is now also available in Philadelphia, Portland, Jacksonville, Sarasota/Naples, Chattanooga and Nashville. Comcast didn’t reinvent the wheel with their security system. They rebranded iControl Networks’ Open Home automation and security platform. Pricing? $199 for the “basic package” that didn’t impress us, or $299 for the “preferred” package which comes with the bells and whistles. Installation is sometimes included in those prices, but a $50 “activation fee” also applies. Expect to pay $30 for basic monitoring, $40 for “preferred” monitoring each month for a minimum of three years — an early termination fee applies if you cancel early. Also expect to pay more for any optional extras you add. Verizon's alarm system was promoted at this year's Consumers Electronics Show. Verizon Communications’ new ominously-named “Home Monitoring and Control” system is powered by its fiber to the home FiOS service. Introduced at this year’s Consumer Electronics Show, Verizon has teamed up with lock-maker Schlage, who manufactures the “smart door locks,” and Motorola, which throws in 4Home, their home automation platform. Trane even includes a smart-thermostat, remotely controllable. Unlike systems sold by cable competitors, Verizon’s is budget-minded, priced at just $9.99 per month. But the system package at that price is not remotely monitored and was designed to be sold to the do-it-yourself type. For ten bucks, you get to control everything through your television set top box, smartphone, or tablet computer. If you want more, you pay more. An upgraded package includes remote door locking/unlocking and remote controllable webcams that you can pan and zoom. The deluxe package throws in the remote monitoring service and a smart-home energy use suite that let’s you monitor and control energy consumption of your home appliances. “The more services they can get someone to sign up for, the stickier that customer is to them,” said Bill Ablondi, director of home systems research for the Parks Associates market research firm. Most systems will come with a term contract of 12-36 months, and many could fetch discounts for heavily-bundled customers. Most insurance companies also provide up to a 15 percent discount on homeowner policies for remotely monitored burglar and fire detection systems. For the cable and phone companies, home security could easily bring another $40 a month in revenue and put many cable bills north of $200 a month in combined services. Since virtually all of the systems were developed by third parties, development costs are low, and since existing broadband service in most homes provides ready connectivity to an alarm monitoring center, the costs to provide the service are minimal. For existing security companies, the pending threat of big cable and phone companies eating their business for breakfast isn’t one they are taking lying down. ADT is developing its own suite of home automation and security monitoring, and didn’t waste anytime taking a swipe at the cable companies. For the Cable Co’s, I assume that the monitoring data is being sent over your Internet connection? Does this count against your caps? How often do you have cable outages vs PSTN outages? Which would you say is more reliable?